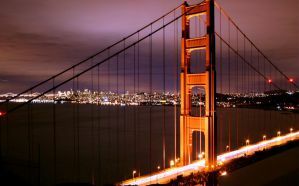 San Francisco is a favorite travel destination for both domestic and international travelers. It is a colorful city that sits right on the bay and there is a lot to offer all types of travelers. If you're looking for adventure and sports there are plenty of hiking opportunities just outside of the city. If you're looking for culture and art, there are museums and diverse neighborhoods that will meet your needs. And if you're looking for great food, then there are countless restaurants offering ethnic or local cuisine. This is truly one of the must-see cities in United States. Many of the hotels are located in the Union Square neighborhood. This offers visitors access to the BART subway system as well as the cable cars and buses. It's also in easy walking distance to many of the most popular neighborhoods and attractions. Do be prepared to walk up some steep hills however. San Francisco is famous for its large hills and you likely won't be disappointed. Other popular neighborhoods for hotels include Fisherman's Wharf and the Financial District. This is a partner hotel to the prestigious Orchard Road Hotel in Singapore. It's a charming boutique hotel that offers excellent service and hospitality. It's located just two blocks from the famous Nob Hill neighborhood and is very close to Union Square. It's also just three blocks from the theater district. The hotel combines an intimate atmosphere with chic style and eco-friendly practices. The decor within the hotel takes advantage of luxurious woods, vaulted ceilings, and arched entryways giving it a grand feel. There are also conference rooms, a restaurant, and a fitness center available to guests. It's a ten story hotel with over 100 guest rooms which offer free wireless internet, dvd and cd players, and organic bath products. This is a modern hotel near Union Square in the heart of San Francisco. It has a charming Italian atmosphere and is a welcoming place. The hotel has recently been renovated and the rooms are surprisingly spacious. There are many amenities available to guests including a fitness center on the top floor, private saunas, complimentary wireless internet, spa services, laundry service and more. There is also a restaurant on site, Zingari Ristorante, that serves delicious Northern Italian cuisine. Finally, after a wonderful day exploring the city you can head to the top floor lounge and take in the views of the city at night. There's a wonderful rooftop terrace attached to the lounge where you can see the city light up. This grand hotel is located in the historic Haslett Warehouse, which dates back to 1907. It's made of exposed brick and offers impressive seaside character. It sits on the edge of the Fisherman's Wharf area and is in easy access to many of the city's best tourist attractions. There are many amenities available to visitors to help ensure that there visit is of the highest standard. Guests can enjoy a complimentary evening wine hour or take advantage of in-room morning coffee. There is also complimentary high speed internet access. There are over 200 guestrooms available which are decorated with porthole mirrors, anchor-motif bedding and interesting throw pillows. The decor sticks with the nautical theme, giving the hotel a unique atmosphere. Guests will also receive complimentary yoga baskets to help make their stay even more enjoyable. This hotel offers an old world elegance with contemporary comforts. It's a luxury boutique hotel that was designed by Pilippe Starck using eclectic furnishings and a diversity of styles. It's one of the more unique hotels in San Francisco, and if you're looking to stay somewhere that embraces the atmosphere of the city then this is a great option for you. It's located a short distance from Union Square and the city's Financial District, as well as many of the most popular attractions around town. Guests also have access to the fitness center, bicycle rental, a nearby health club, and an indoor pool. Rooms range from basic studios to suites and private apartments. There is wireless internet access and spa services available as well. 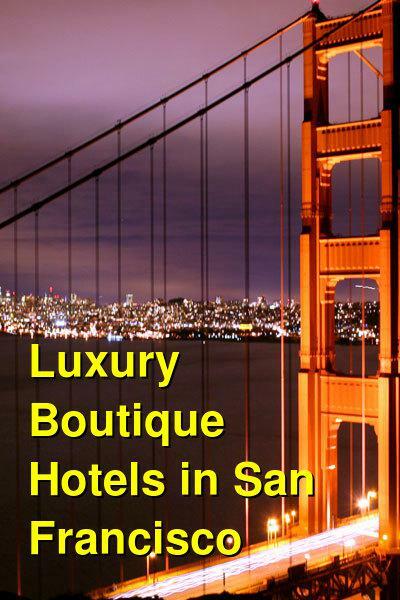 Located in downtown San Francisco near the Crocker Galleria, this hotel is just a couple of blocks from Union Square. It's also in easy access to Nob Hill, Chinatown, and Powell Street. The hotel is impressive in design, still having it's original Art Nouveau detailing, there are many features including a crystal skylight, a marble staircase, and luxurious furnishings. There are 177 guestrooms that are decorated with a Euro-influenced theme. Guests have access to wireless internet, as well as a business center, fitness center, and wine receptions every evening. Rooms range in size from studios to suites.